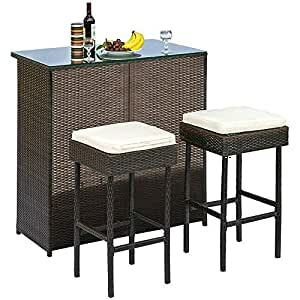 Patio bar set features 1 elegant tempered glass extra-wide top bar table and 2 square barstools with beige cushions. A classic yet simple design, this outdoor wicker bar set is perfect addition for outdoor wickers patios, backyards, porches, gardens or poolside. Enhanced the joy of party or small gathering with friends. Additional storage space is available underneath the glass top, contains 2 shelves ideal for storing drinks, mixers, ice, dishes, cutlery and more! Hand-woven brown synthetic resin wicker designed for the outdoors. It is weather and UV resistant. Looks great in any setting and easily match with other patio furniture. User friendly instructions manual and all necessary tools or hardware are included for smooth and easy assembly plus 1-year warranty on framework.